Photo: Ana Vigueras. Creative Commons BY-NC 2.0 (cropped). 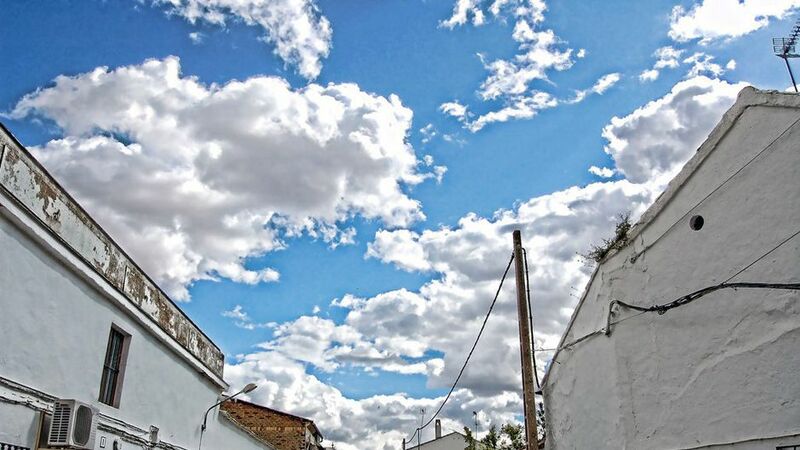 In the south of Spain, the street is the collective living room. Vibrant sidewalk cafés are interspersed between configurations of two to five lawn chairs where neighbours come together to chat over the day’s events late into the night. In mid-June the weather peaks well over 100 degrees Fahrenheit and the smells of fresh seafood waft from kitchens and restaurants as the seasonably late dining hour approaches. The scene is archetypally Spanish, particularly for the Andalusian region to the country’s south, where life is lived more in public than in private, when given half a chance. Specifically, this imagery above describes the town of Marinaleda, which would be indistinguishable from its local counterparts in the Sierra Sur mountain range, were it not for a few tell-tale signs. Maybe it’s the street names (Ernesto Che Guevara, Solidarity and Salvador Allende Plaza, to name a few); maybe it’s the graffiti (hand-drawn hammers and sickles sit happily alongside circle As, oblivious to the differences the two ideologies have shared, even in the country’s recent past); maybe it’s the two-story-high portrait of Che emblazoned on the outer wall of the sports stadium. Marinaleda has been called Spain’s “communist utopia,” though the local variation bears little resemblance to the Soviet model. Classifications aside, this is a town whose social fabric has been woven from very different economic threads than the rest of the country since the fall of the Franco dictatorship in the mid 1970s. A cooperatively owned olive oil factory, houses built by and for the community, and a famous looting of a large-scale supermarket, led by the town’s charismatic mayor, in which proceeds were donated to food banks, are amongst the steps that have helped position Marinaleda as a beacon of hope. Rather than rely exclusively on cash to get things done, Marinaleños have put their collective blood, sweat, and tears into creating a range of alternative systems in their corner of the world. As the Spanish economy continues its post-2008 nosedive, unemployment sits at 26 percent nationally, according to the International Business Times, while over half of young people can’t find work. Meanwhile, Marinaleda boasts a modest but steady local employment picture, in which most people have at least some work and those that don’t have a strong safety net to fall back on. But beyond its cash economy, Marinaleda has a currency rarely found beyond small-scale activist groups or indigenous communities fighting destructive development projects: the currency of direct action. Rather than rely exclusively on cash to get things done, Marinaleños have put their collective blood, sweat, and tears into creating a range of alternative systems in their corner of the world. When money hasn’t been readily available — the lack of it is probably the only consistent feature since the community set out on its current path — Marinaleños have turned to one another to do what needs doing. At times that has meant collectively occupying land owned by the Andalusian aristocracy and putting it to work for the town. At others it has simply meant sharing the burden of litter collection. While still operating with some degree of central authority, the local council has devolved power into the hands of those it serves. General assemblies are convened on a regular basis so that townspeople can be involved in decisions that affect their lives. The assemblies also create spaces where people can come together to organize what the community needs through collective action. “The best thing they have here in Marinaleda, and you can’t find this in other places, is the [general] assembly,” says long-term civil servant for the Marinaleda council, Manuel Gutierrez Daneri. “The assembly is a place for people to discuss problems and to find the solutions,” he continues, pointing out that even minor crimes are collectively addressed via the assembly, as the town has no police or judicial system since the last local cop retired. In his time as mayor, Juan Manuel Sánchez Gordillo has managed to leverage considerable financial support from the state government, a feat which Gutierrez Daneri attributes to the town’s track record for direct action. “If you go ahead with all of the people behind you, that is very powerful,” he says. Even minor crimes are collectively addressed via the assembly, as the town has no police or judicial system since the last local cop retired. As a result, the small town boasts extensive sports facilities and a beautifully maintained botanical garden, as well as a range of more basic necessities. “For a little village like this, with no more than 2,700 people, we have a lot of facilities,” says Gutierrez Daneri. British ex-pat Chris Burke has lived in Marinaleda for several years, and he explains that access to the public swimming pool only costs €3 for the entire summer. Burke recounts Mayor Sánchez Gordillo saying to him, “The whole idea of the place being somewhere good to live is that anyone can afford to enjoy themselves.” Burke says he believes that projects operated at a financial loss are essential to utopia. In 1979, Sánchez Gordillo was first elected as the town’s mayor. He led an extensive campaign to change Marinaleda’s course, which began with hunger strikes and occupying underutilized land. Manuel Martin Fernandez has been involved in “la lucha” (the fight) since the beginning. He explains how through the general assembly process the community decided something had to be done to stem the flow of migration from the town. They began a weeks-long occupation of a nearby reservoir to convince the regional government to allocate them enough water to irrigate a tract of land. Today, extensive fields of olives, artichokes, beans, and peppers form the backbone of the local cash economy. The land is collectively managed by the cooperative El Humoso and a canning facility has been set up on the edge of town. “Our aim was not to create profits but jobs,” Sánchez Gordillo told British author Dan Hancox, explaining why the town chose to prioritize labour-intensive crops to create more employment for local people. Like most agricultural employment, whether in the fields or the factory, work in Marinaleda is both seasonal and varied from year to year. But unlike many small agricultural towns, Marinaleda shares the work among those who need it. Dolores Valderrama Martin has lived in Marinaleda her entire life and she has worked at the Humoso canning factory for the past 14 years. From the upstairs office she explains that if 200 people are looking for work, but they only need 40 workers, they will bring everyone together. Most of the town decries the relative lack of work, but the wider social security net built on the principles of direct action and mutual aid have meant that unlike other parts of the country, two months’ wages can go a long way to keeping you afloat for the year. At the core of this is the town’s approach to housing, which offers one of the clearest examples of how collective effort can fill the void left by a stagnant cash economy. When many young people think about making their first foray into the housing market, money is inevitably the biggest obstacle. State of the economy aside, a down payment is always a sizeable sum, even in relatively tame markets, and is increasingly unattainable for what has been described as “the jilted generation”. While capitalism frames our relationships as a series of self-interested economic transactions, Marinaleda relies on a model of mutual aid. Housing has been partly removed from the free market in Marinaleda using a combination of state housing subsidies for building materials, free labour for construction, and land given by the town. Photo: Naturalezartificial AMA ETSAS 0809. Creative Commons BY-NC-SA. 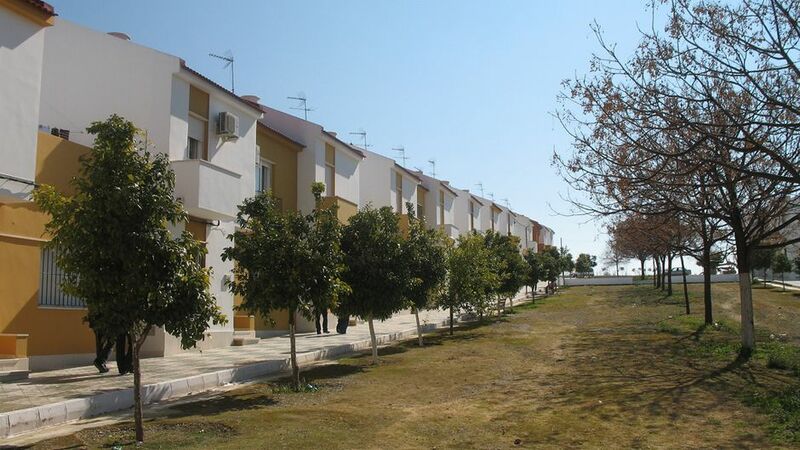 But through a maverick decision spearheaded by Mayor Sánchez Gordillo, housing has been partly removed from the free market in Marinaleda using a combination of state housing subsidies for building materials, free labour for construction, and land given by the town. Community members come together with architectural plans provided by the council to build a block of houses, with no sense in advance of which home will belong to which family. The houses — some 350 units in total, with 20 new builds underway at the time of our visit — become part of a housing cooperative. Needless to say, when citizens are only left paying €15 per month for mortgages, this has a massive impact on work requirements. While capitalism frames our relationships as a series of self-interested economic transactions, Marinaleda relies on a model of mutual aid, as locals work together to meet shared needs, with far less money circulating. While it can be easy to forget, money is simply a way of facilitating action, which creates an incentive for people to do tasks that they otherwise may not have any interest in doing. Direct action, on the other hand, is rooted in common interests and explores the practicalities of what needs doing, based on who is there to do it. Direct action eliminates the consumer-provider divide, making cash an unnecessary intermediary in getting things done, as those who want something done, and those doing it become one-in-the-same. While Marinaleda has its flaws, it reminds us that alternative economic models are not only possible, they already exist. A striking piece of graffiti on Marinaleda’s main road depicts a dream-catcher, super-imposed with a hammer and sickle. The accompanying message implores us, ‘Catch your dreams — utopia is possible’. This article first appeared on Contributoria. The Spanish Town Where People Come Before Profit by Jen Wilton and Liam Barrington-Bush is licensed under a Creative Commons Attribution-NonCommercial 4.0 International License. Jen Wilton is a researcher and journalist particularly interested in the politics, history and social movements of Latin America. Wilton recently co-wrote a series of articles looking at Canadian mining in Mexico as part of an Investigative Journalism Fellowship with the Tyee in Canada. She has also written for various publications including the Guardian, Canadian Dimension, New Internationalist, Intercontinental Cry and Indigenous Peoples Issues and Resources. She blogs at revolutioniseternal.wordpress.com/. Liam Barrington-Bush is an activist, facilitator, and author of the new book, ‘Anarchists in the Boardroom: How Social Media and Social Movements Can Help Your Organisation to Be More Like People’.